Schedule in time for your decluttering session. Plan in plenty of time! I mean really, honestly plenty of time. If you are like me you might have more than 1 closet full of clothes. In this case, it´s better to plan in more than 1 weekend for decluttering your closet otherwise it might be quite overwhelming. You want to take out all the garments you own to receive a full picture of the dimensions of how many garments you own. It can be quite shocking especially when you love to shop and have a lot of garments hiding in your closet. 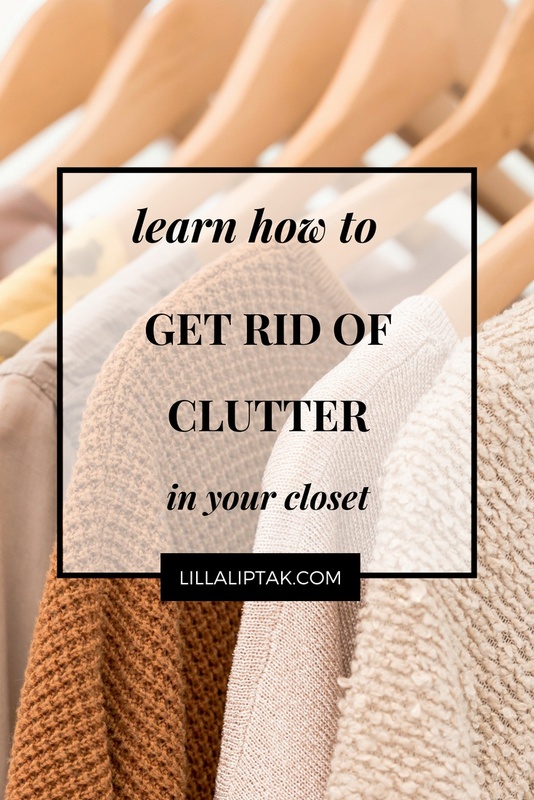 Once you scheduled your decluttering sessions in your calendar or bullet journal and are ready to start the next step is to figure out which garments to keep. 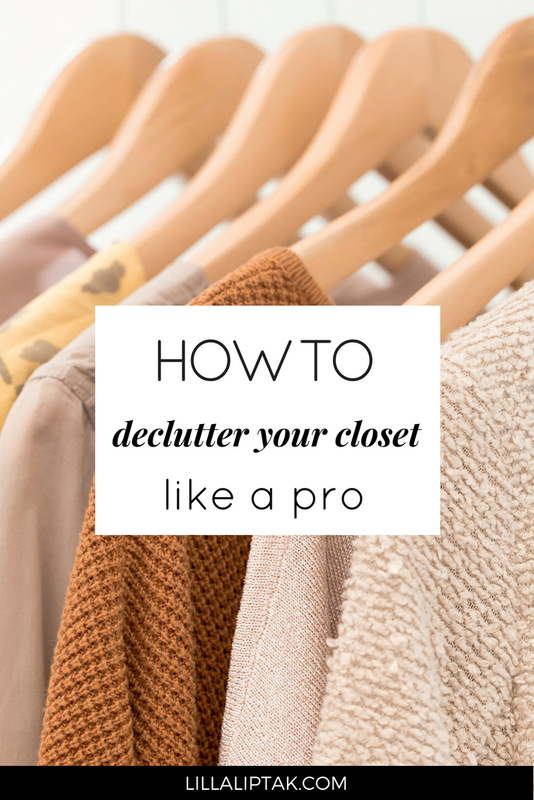 I decluttered my closet 2 years ago myself and the following strategy worked very well. That´s why I want to share it with you. Start at 1 pile at a time and go through each and every garment individually. Do I love this garment? When was the last time I wore this garment? Will I wear it in near future again? Why did I buy it? Was it an emotionally driven impulsive buy or did I buy it because I totally fell in love with this piece? After answering these questions to yourself you then decide in which box the garment will end up. The box with the label KEEP is the one which will go back to your closet. Remember the garments in the box “KEEP” are those which you really love to wear and enjoy to have them. You have 100% positive feelings when you hold these garments in your hands. They are literally giving positive energy to you just by being there. 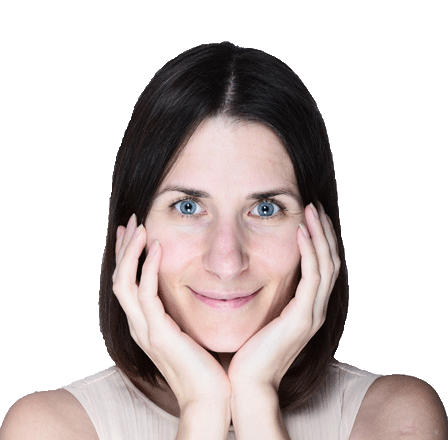 “Does this garment make me happy?” – should be your guiding question while you assign the garments to the certain boxes. The maybe box is the hardest. Here are all the garments you don´t love so much that they can make it into the keep box, but you are also not 100% ready to let them go. Therefore just after examining and putting all your garments into the appropriate boxes, it´s time to take a closer look at your MAYBE box. Are these personal souvenirs from your past you don´t want to let go of? Can you assign a new role to this garment? Are there some pieces you are ready to let go? You can go further and examine if you connect a positive or a negative feeling with these certain garments. Example: I had a sweater in my maybe box which I bought in 2007 during my vacation in Honolulu, Hawaii. I haven´t worn this sweater for years and it didn´t match my current lifestyle anymore, but I connected a very positive emotion to this garment, which was the memory of my vacation in Hawaii. Therefore I decided to keep the sweater and to assign a new role to this garment. The new role was to wear this sweater exclusively at home while I relax. In this box are all the garments you are ready to let go. They are in a good condition, but either doesn´t match your current style anymore or simply don´t fit. I bet we all have a lot of these garments in our closets! What to do with these garments? You can take a picture of each garment and advertise it on eBay or facebook marketplace. The positive effect is that you can make some cash with things you don´t need anymore. It might seem to be peanuts, but if you have a lot of garments to sell these can add up easily to several thousands of dollars extra cash. The downside is that it takes time to take the pictures and to upload them to the internet. It also takes time until you sell all the stuff and when you advertise them on eBay it costs money to do so. Here are some ideas with suggestions where you can sell your clothes online if you are from the US. Ask a second-hand shop close by where you live, if they are interested to take the garments. Usually, second-hand stores get around 50% commission of the garments they sell for you while you get the other 50% of the predetermined selling price. Depending on the concept of the second-hand store they just take a certain type of garments. For example, only branded garments or only vintage garments. It might be different for each thrift store. Some stores take the garments for 3 months and if they won´t get sold during this time you have to pick them up again. The positive aspect is that your garments are gone immediately from your closet. You also don´t have much stress with selling the garments as the store does this for you and you get some extra cash when the garments get sold. Another possibility is to sell the clothes at a flea market nearby. You can also organize a garage sale at your home and sell them from there. The positive aspect here is, that it doesn´t take much preparation time and you make some cash. One negative aspect is that you most likely will get less money for the garments as you would get from selling them online. This can be a really fun way to get rid of the clothes you don´t want anymore. Simply organize a garment swap party. Invite some of your friends over, ask them to bring the clothes they don´t want and need anymore and start swapping your clothes. You won´t make money from this experience, but you will spend some great time with your friends and it will be a lot of fun! Eventually, you´ll also find some new garments in the closet of your friends for yourself while letting go of the garments you don´t want anymore. Look up on the internet which charitable institutions are located nearby and donate your garments from box number 3. The positive aspect of this is that the garments will be gone immediately. You also support people in need with your help by simply donating the clothes you don`t need anymore. It´s awesome! This box is solely reserved for all your garments which you don´t want to keep, don´t want to sell and don´t want to donate. These might be socks or other garments with excessive holes or stains for example which are ready to be upcycled (if you like crafty projects) or thrown away. After going through all 6 steps you should only have garments in your closet left, which you wear and really love. Now it´s time to take a closer look at these garments. They might not match to each other, but you want to have outfits right!? Therefore it´s time to create your personal capsule wardrobe. Examine all the garments you decided to keep. Are they representing a certain style or feel? Are these mainly basic garments or extravagant pieces? Do they all match your current style? On the basis of this analysis, you can now look for complementary pieces to make outfits which match to your current lifestyle. 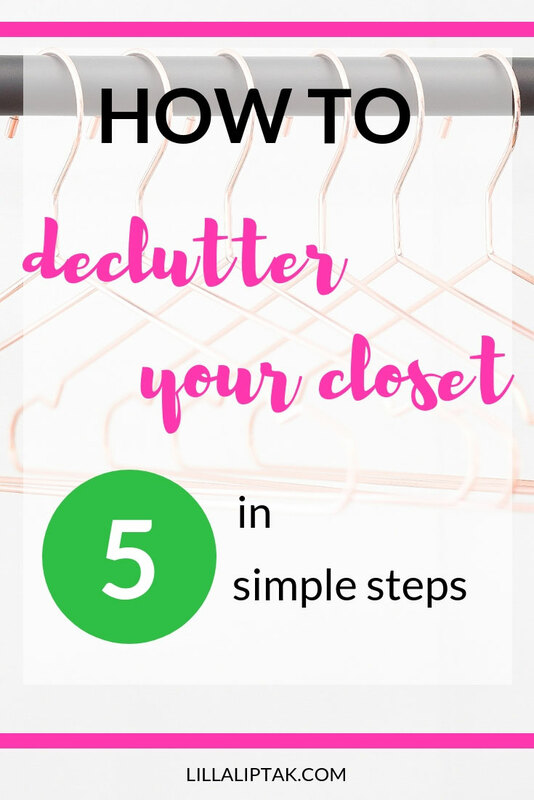 What is your experience with decluttering your closet? Share your thoughts here!